You are attempting to access our Members Only area of customerservice@retaildiscountshop.com. 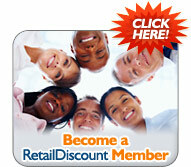 If you are currently a Retail Discount Shop member, please sign in to access our Members Only area. If you are not yet a Retail Discount Shop member, please click here to join today and receive your $15 cash back reward and free 30 day trial membership.